Because this website, and the business it represents, are image-oriented, I try to have some sort of stimulating GIMP work at the top of each post. The cost of this self-imposed policy is that many fascinating family history stories will go overlooked—unless I manufacture some visually stimulating way to represent the story. Having recently made a bit of a breakthrough on today’s features ancestor, I wanted to write-up here what I had found. I don’t have a photograph of him, though, so I had to get resourceful. Here before you is the grave of Denis Graham, who was the uncle of my great-great-grandfather, John C. Graham. I’m not really one to doctor gravestone images, but since I recently picked up a few new tricks, I thought I’d see how far I could take them. In this image, I’ve attempted to remove the rain-induced dampness in the original photograph to present the gravestone as if it were dry. The results were middling, in my opinion. Had I attempted this project for a client, I would have given it more time. Since I’m already a week overdue on Ancestor #25, I figured I’d post what I have and move along. The hardest part of this project is putting life back into the engraved flowers. There wasn’t much left in them after removing darkness of color. 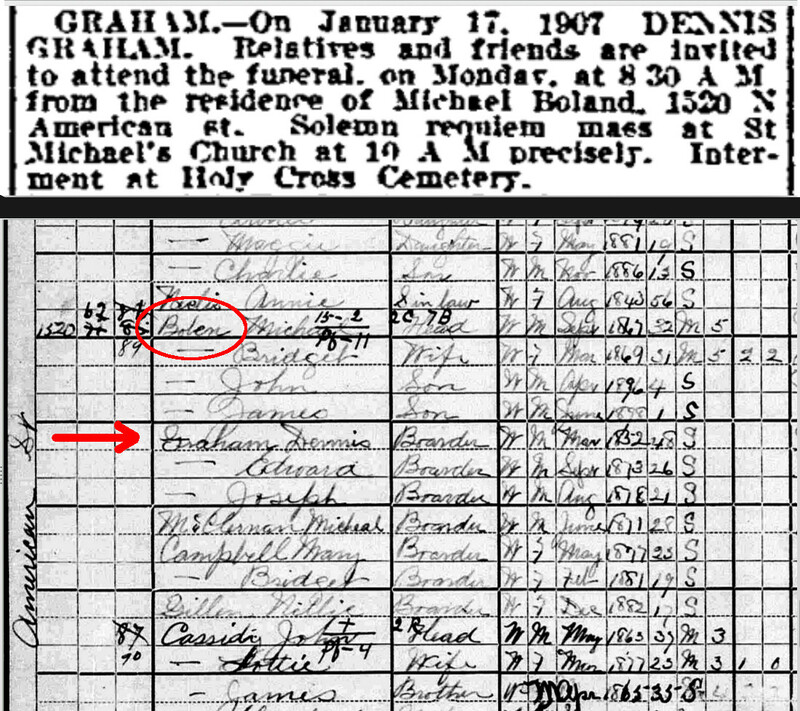 My accidental discovery of Denis Graham’s death notice in the Inquirer of 18 Jan 1907 led to my discovery of the Boland (misspelled ‘Bolen’) and Graham families in the 1900 census. Further accounting for my tardiness this week, I have been tirelessly at work digitizing all of my Frank Zappa records and building a Gentoo Linux laptop computer for workstation. I guess maybe you could say I took a mid-year vacation from 52A. Now that I’ve got my Gentoo box working to the point at which I can blog upon it, I present to you, Ancestor No. 25: Denis Graham. I first discovered him by chance, while browsing the Philadelphia Inquirer death notices for someone else. Of course, whenever I see my own surname in the death notices, I pause to see if I can identify a relationship. Graham is such a common name, so usually I can not. This time, however, I recognized that his address, at the time of his death in 1907, was the same as that of my great-great-grandfather. Researching Denis’s name in the 1900 census revealed him living with the related Boland family, which had eluded me because their name was misspelled. I arguably would have discovered these things inevitably, but I won’t turn down a little luck to speed things up. Denis’s monument is one of two examples of a known incorrect date appearing on a monument in my family tree. The death date of his lot mate, Mr. Martin Boland, should read 1904, not 1907. How that came to be requires some explanation: The relationship between Denis and Martin is not straightforward. Martin is the brother-in-law of one Denis’s neices, but I understand that the Graham and Boland families have been friendly since they both lived in Ireland. 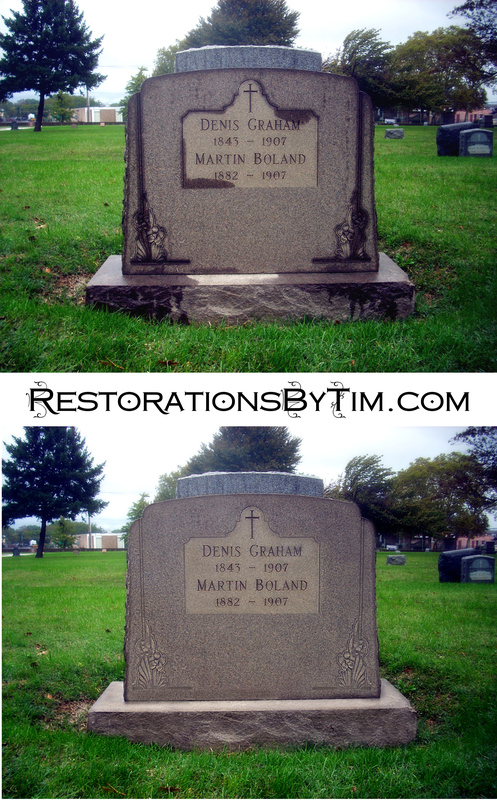 When Martin Boland died at the age of 24, he was first buried Holy Cross Cemetery in Yeadon, just outside of West Philadelphia. Upon Denis’ death in 1907, Martin’s remains were removed, and reinterred with Denis at New Cathedral Cemetery in North Philadelphia. I imagine there was no monument at the location for quite some time. Whoever eventually placed the monument there probably looked only at the dates of burial in New Cathedral Cemetery’s burial records. Those records naturally reflect the year of burial as 1907 for both people. As the uncle of my great-great-grandfather, John, Denis is my clearest link to the prior generation. I could tell from census records that Denis was much older than John and his siblings. I had long suspected he was their uncle, but immigration records have only recently confirmed that suspicion. A Philadelphia passenger list index card first identified the relationship, and the original ship’s manifest turned up shortly thereafter. This journey was not Denis’s original passage to America, however. That occurred in 1890, according to census records. I am still on the hunt for that 1890 passenger list. Uncle Denis was a “Hammer Man”. Opponents beware. I’ve just discovered him and his sister, Anne McFall, in the 1881 Scottish Census. This gives color to the unsupported claim the John C. Graham’s father (Denis’s brother) “came from Scotland“. As far as I can tell from the Irish and Scottish censuses, John’s aunts, uncles, and probably parents, were all born in Ireland, but some of them were apparently living in Scotland around 1881. I know that Anne McFall was back in Ireland for the 1901 and 1911 Irish censuses, and Denis, of course, came to America. I’d like to discover the times at which the various members of the family move to and from Scotland. And that’s my story about Denis Graham. I know little else about him but these things: According to his death certificate, he was born in Ireland on August 1, 1843. He emigrated to America in 1890, according to the 1900 census. He sailed again to Ireland in the early 1900s, and returned to America on Halloween, 1904. He died a single man at the age of 63 on January 17th, 1907, according to the same death certificate. His 1904 passenger lists identified him as a Forgeman, by trade. His 1881 Scottish census calls him a Hammer man. Maybe I’ll call him Uncle Thor.